hoy tengo una camiseta .... Esto caras del tigre de impresión se encuentra a menudo en varias combinaciones ..
Les deseo a todos un buen día! ..
today I have a T-shirt .... This print tiger faces are often found in various combinations ..
How do you do ?? I wish all a good day!!! ..
Guapisima,me gusta todo,un look muy muy rockero. If you have time, please check out my blog and maybe follow? Hi!! 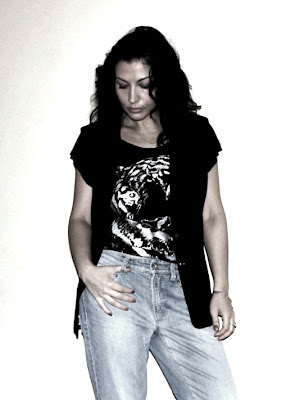 i love this look, I want that t-shirt jejeje.. kiss for you. gorgeous girl I love your style sweety,thanx so much for the lovely compliment,followed you back GLADLY!!! love how you roled up the jeans, giving them a different look. Your graphic lion tee looks awesome with the bf jeans and vest! thanks for coming by dear! the print on the t-shirt is soo cool!